Gorillas are becoming increasingly endangered; it has been reported that there are approximately 700 mountain gorillas remaining on the planet. Since 2008, the IUCN’s red list has considered gorillas to be critically endangered. In particular, the mountain gorilla has become the most endangered of the gorilla species. Gorillas have few natural predators, but the increase in deforestation as well as civil wars, have caused the gorillas in the Democratic Republic of Congo to become shockingly endangered. 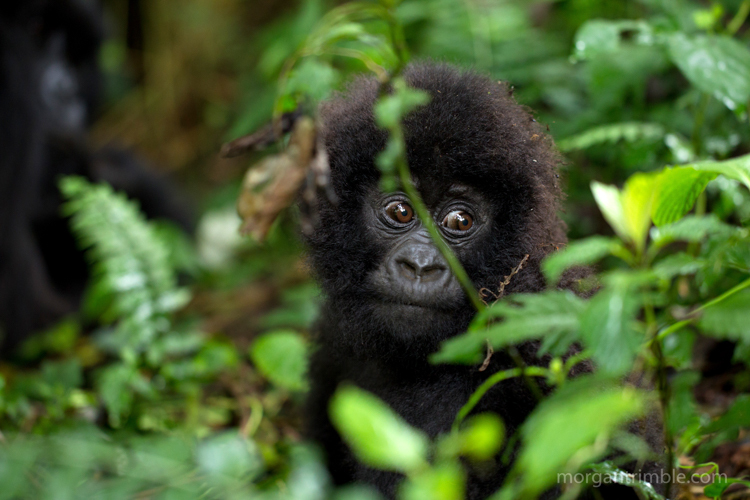 The mountain gorillas inhabit the volcanic slopes in Rwanda, Uganda and the Democratic Republic of Congo (the DRC). Gorillas are dependent on one another as they are very social animals, and rely on the leader of the band- often known as the silverback, to organize their daily activities such as nesting, eating, and travelling amongst their grounds. When a member of the band is killed, the gorillas struggle to find routine again in the chaos. Although hunting, poaching, consuming and trading gorillas is illegal in most African countries, poaching continues due to the lack of enforcement. The bush meat trade is currently the biggest threat gorillas face. In places such as the DRC it is believed that the socially elite and prestigious consume gorilla meat, making it a sought after commodity. A mountain gorilla from the Kabirizi family at Virunga National Park sits quietly in some bushes waiting for the rain to stop. Virunga National Park is the oldest national park in Africa and a World Heritage Site. It is is home to more than a quarter of the world’s remaining 790 critically endangered mountain gorillas. Seven of the eight volcanoes in the Virunga range lie within the park, including Nyiragongo, one of the most beautiful and active volcanoes in the world. To the north stand the snow-capped majestic Rwenzori Mountains, over 5,000 metres high. Often poachers will capture the young gorillas to sell them to a zoo, or research labs, but in order to capture the offspring they must kill an entire band of gorillas due to the gorilla’s protective instincts of their young. This careless destruction of a family of gorillas often leaves orphaned gorillas to fend for themselves in the wild. Baby gorillas are dependent on their mothers for three years after their birth, as the mothers nurse them for two years as well as groom them and carry them. The babies left by the poachers are in danger as they are left without a mother to care for them. Often poachers will kill a troop of gorillas in order to capture the young gorillas to sell them to a zoo, or research labs. In many African countries such as the DRC bush meat is a highly profitable business that comes at a high cost- the endangerment of species such as gorillas. Since the hunters can earn a significant amount in the trade, it has become an enticing way to make a living. Hunters often make traps out of twigs and wires, that pull a noose tight when the leaf-covered trap is stumbled upon. Hunters set 50 to 100 traps each day. And although these traps are not always meant for the gorillas, they often fall into them causing more of the population to decline. Gorillas also face habitat loss due to deforestation caused by the demand for road construction. As the logging companies tear down the forests, they clear a path for the poachers to access the gorillas more easily, and even to access areas they couldn’t have gotten to with the trees overbearing the land. The logging companies also aid in the distribution and consumption of bush meat. The poachers sell the meat to the truck drivers, and use the logging vehicles to distribute the meat to markets further away. With the endangerment of these animals, people have stepped in to help conserve and protect the species. Jean Mapima, the Chief Administrator of the Lac Trumba-Lediima Forest Reserve in the Congo acknowledges the dangers of the increase in hunting and consumption of bush meat. “Traditionally, hunting was done mainly for subsistence, for family consumption. However, people are increasingly engaging in commercial hunting, which is progressing fast — we see this as something very, very dangerous.” People like Jean are working hard to conserve these species that are disappearing far too quickly. With the help of the conservation initiatives such as those at Virunga National park in the DRC, the gorilla population is becoming steady and even slowly increasing. Several volunteers, as well as veterinarians take care of the gorillas on a daily basis, from rescuing abandoned gorillas to protecting the grounds on which they live. The park rangers risk their lives each day to keep the gorillas safe, with over 130 rangers losing their lives in the fight to protect the gorillas. The park rangers risk their lives each day to protect the grounds and keep the gorillas safe, and in some tragic incidences park rangers have lost their lives defending the gorillas. At Virunga, the volunteers work closely with the gorillas to gain the trust of the young orphans. Andre Bauma, a worker at Virunga has formed a loving bond with a young gorilla named Ndakasi, one of gorillas who survived the poaching in 2007, but sadly lost her mother in the attack. Ndeze and Ndakasi, two of the only four orphan mountain gorillas in captivity with Andre, their caretaker. The gorillas, old and young, are thriving in the park, thanks to organizations and conservation initiatives the population is becoming stable and is even slowly increasing. In 2007, Virunga faced a dark time when a family of gorillas was attacked by poachers. A total of nine gorillas were killed, including three mothers, and the male leader of the pack who were all shot and killed. The troop was lost without their leader, causing the other members of the group, especially the young to struggle to find their food and remain an organized society. Incidences such as this shine light on the importance of protecting and preserving wildlife such as gorillas. The documentary Virunga, a film released in 2014, shows the struggle the park rangers face as they meet a new threat to the park- the M23 rebel group. As this newly formed group declares war, the rangers and staff of the park must work harder than ever to protect the wildlife, and everything they have worked so hard to build over the years. Driven by greed, the rebels search for oil in the park, destroying anything in their pathway. The rangers of the park are risking their lives even more to protect the park against the rebels, as the rebels enter the park illegally to seek the oil. The park director Emmanuel de Merode was attacked and shot several times after he reported the illegal activities of the oil companies; thankfully Emmanuel survived the attack, and continues to protect the park, although it has become an increasing risk. The purpose behind Virunga National park is not only to conserve and protect the wildlife, but to sustain the environment for their children and future generations. Not only are they protecting the park, but they aim to rebuild the country. Five years ago the park was barren land, and the animal population was scarce. Today, the populations of the various species within the park are thriving. The caretakers work closely with the orphaned gorillas not only to feed and care for them but to play with them, and help them feel as if they are a part of a family rather than feel a sense of abandonment. Andree Bauman explains in the film that he is not only a father, but a mother to these young orphans, as he has given them the motherly care needed to grow and develop. In the past couple of years, the gorillas old and young are thriving in the park. The park has increased their security in order to prevent issues in the future. The dedicated rangers in Virunga have helped to allow the population to grow, as well as remain healthy. The rangers work tirelessly, endangering their own lives on a daily basis in order to protect the animals and their habitat. The main threat to gorillas is not a predator or a natural cause, but greed. The greed of the poachers and the greed of oil companies are destroying their habitat, and driving the species to extinction. But the people stand by the park and remain hopeful, as they continue to protect the animals and the land in hopes for the animals to continue to thrive, and for the park to live on in the future.